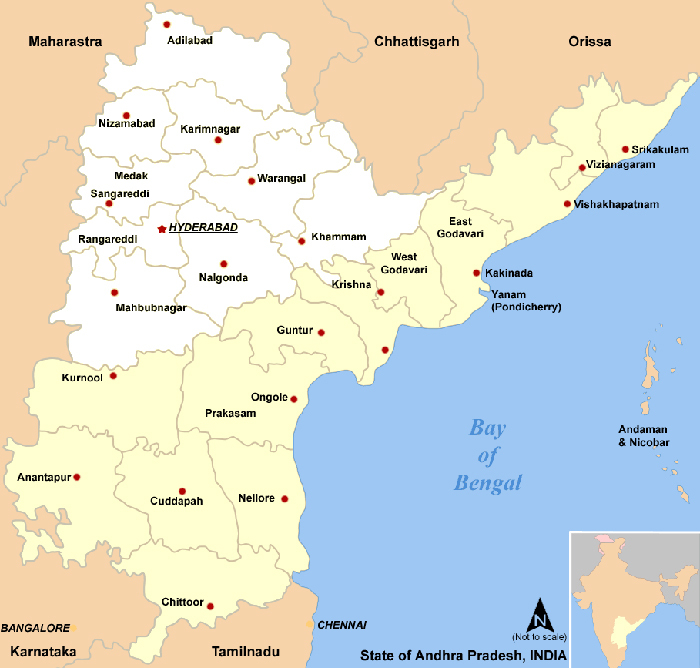 Andhra Pradesh is on India’s southeastern coast. It is the eighth largest state in India covering 61,855 square miles. In 2014, a portion in the northwestern part of the state containing Hyderabad, the largest city in the area, separated to become the state of Telangana. Historically, Andhra Pradesh has been known as the “Rice Bowl of India” as it is the largest producer of rice in the country. It has a rich cultural heritage including folk dance, stone carving, painting, and doll-making. The climate is generally hot and humid with summer temperatures ranging up to 100 F. During the monsoon season from July through September the region receives heavy tropical rains. The Franciscan Family Apostolate works with tribal communities in the hilly northern area of Andhra Pradesh where roads are limited and travel is difficult. The tribes they serve are in the vicinity of Draksharaman and Veeraghattam in Andrha Pradesh and in the area surrounding Jubo in neighboring state of Orissa . Veeraghattam is in the Srikakulam district near the Vatttigedda river. According to 2001 census figures, a population of 63,882 with 8,000 children under the age of 6 spread were across 58 villages and 26 panchayats (another form of village goverance). There was a literacy rate of 47% with Telugu as the local language. The two tribes that the Sisters work with in Veeraghattam are the Savara and the Jathapu tribes. The Savara is one of the most ancient tribes in India and its members are called the ‘people of the forest’. They have a long history of living in isolation from other peoples. Draksharama is a town in East Godavari District of Andhra Pradesh , located on the Gadavari river, with a population of 9,299 in 2011 of which 856 were children below the age of 6. The literacy rate is much higher in Draksharma (80%) than Veeraghattam. Telugu is also the local language here. Draksharama is one of the important centers of Shiva worship in Andhra Pradesh as it is the location of Bhimeswara Swamy temple, one of the Five Powerful temples of Lord Siva. Construction on it began in 800 AD and was completed in the 11 century. The temple is noted not only for its architectural beauty and historical importance, but also for its sanctity and holiness and attracts pilgrims in thousands every year. Jubo is an isoloated mountainous area in the state of Orissa. The next nearest town and health center is 20 km away and the nearest railway station is around 120 km from Jubo. The Franciscan Family Apostolate serves 35 villages surrounding Jubo. These villagers hold on steadfastly to traditional and ancestral beliefs. Parents prefer to take the children to their work area to help in the fields and to care for their younger siblings. Gradually they are getting interested to send their children for education. Farming follows an old model of shift cultivation which has destroyed the forest and caused soil erosion. Though the people are hard working, they earn very little, and their annual income is very low (four to six thousand rupees annually). To learn how you can aid an impoverished family in these regions, please click here.